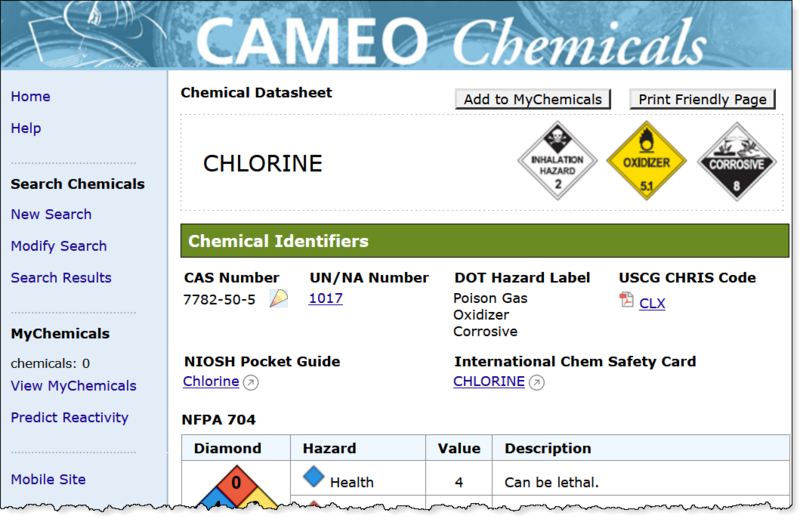 CAMEO Chemicals is a database of hazardous chemical datasheets that emergency responders and planners can use to get response recommendations and predict hazards—such as explosions or toxic fumes. It is part of the CAMEO® software suite, developed jointly by NOAA and the Environmental Protection Agency (EPA). CAMEO Chemicals is available for free in multiple formats. The mobile app and desktop program formats can be run offline, so that you don't have to rely on an internet connection to get your response information. When you're online, you'll also have access to links to the NIOSH Pocket Guides and the International Chemical Safety Cards. The main site is cameochemicals.noaa.gov and the mobile site is m.cameochemicals.noaa.gov. The Windows version can be run on Windows 7, 8.1, and 10 operating systems. The Macintosh version can be run on Yosemite (10.10), El Capitan (10.11), Sierra (10.12), and High Sierra (10.13) operating systems. Other operating systems have not been tested and are not supported. Note: Older Mac versions of CAMEO Chemicals will not be able to use the auto-update feature within the program to upgrade to the 2.7.1 version. Those users should delete their old CAMEO Chemicals program, and then manually download and install the new Mac version using the link above. Part of the chlorine chemical datasheet, showing placards, hazard labels, and identification numbers. CAMEO Chemicals is available as a website, mobile website, mobile app, and desktop program. All of those formats use the same database, so the content is the same (see the development history for details about released versions). Most of the program functionality is the same across formats as well, as shown in the CAMEO Chemicals feature comparison chart. Search through the extensive chemical database in CAMEO Chemicals to find datasheets with critical response information, including physical properties, health hazards, information about air and water hazards, and recommendations for firefighting, first aid, and spill response. Additional datasheets based on UN/NA identification numbers provide response information from the Emergency Response Guidebook (ERG) and shipping information from the Hazmat Table (49 CFR 172.101). On the UN/NA datasheets, ERG Response Guide PDFs are available in English, Spanish, and French. You can also make a collection of chemicals, and then use the chemical reactivity tool to predict what hazards could arise if the chemicals were to mix together. CAMEO Chemicals Fact Sheet [PDF, 815 KB]: Learn more about program features by reading this CAMEO Chemicals fact sheet. CAMEO Chemicals Development History: Read about the changes made in each release of the CAMEO Chemicals program. Questions: Contact us with questions, comments, or suggestions about CAMEO Chemicals.